Front Desk Supply can provide pretty much anything that is printed on paper and plastic. Our areas of expertise includes printing, 4 color/full color printing, folding and gluing, binding and many others. Please contact us for questions on any other products your hotel might need. We offer two styles of maps for our clients. Either is a great tool to provide out-of-town visitors and guests so they can find their way around. Not only do these handy maps provide an easily accessible way to get around a new city, but they also are a great opportunity to include important information such as hotel information, meeting agendas, sponsor messages, directions to the event, etc. We can produce these for most U.S. cities, or if you have your own local maps and need a place to display them. Wallet Size Maps: These are folded to an approximate wallet size / credit card sized item and then unfolds to an 8 1/2 x 11 (standard paper size) to reveal the overall map. These handy products can be used as an insert in the key folder, or given out on their own. They can include information about the hotel grounds, or just a convenient way to get around the local city. Integrated Map and Key Sleeve: This innovative product provides a place to hold the key, along with a sheet to include either a map of the city, a property map, or vital information about the area and property. This is a great way to save money by combining several of your collateral pieces: Key sleeves and property information / area information. Please let us know if you would like samples. 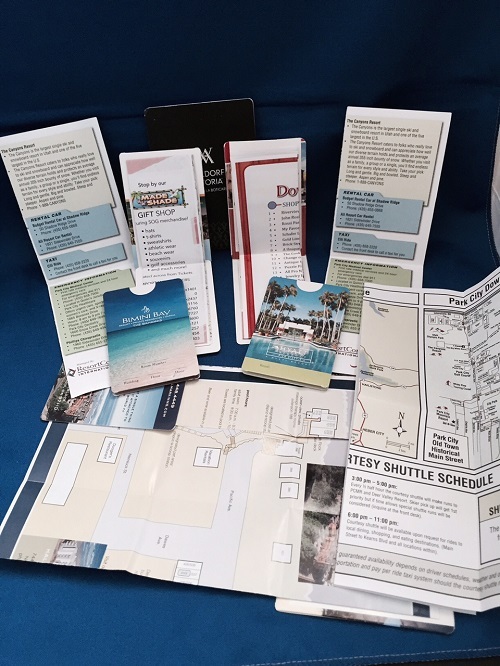 Please contact us to discuss how to best incorporate these products into your portfolio of important items to give your guests when checking in. We have seen lots of ways both of these products have been used.